Hidden Lakes Dental Care, PC offers dental implant solutions for patients with missing teeth that look and feel much like real ones. We know how important it is for you to smile with confidence, knowing that your teeth look great. 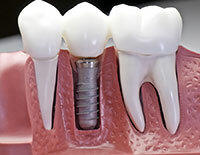 We use advanced technology available to provide quality dental implants to our patients in the Bolingbrook area. Personalized Service: Our doctors will work with you to develop the best individual treatment plan for you. Hidden Lakes Dental Care, PC is committed to the best personalized service and quality care. Financing Available: Hidden Lakes Dental Care, PC accepts cash, checks, and credit cards. We also offer a flexible No Interest payment plan to help you pay for treatments that your insurance doesn't cover. For more information please call Hidden Lakes Dental Care, PC at (630) 759-0077 today!